President Donald Trump speaks in the Rose Garden of the White House in Washington, Jan. 25, 2019. 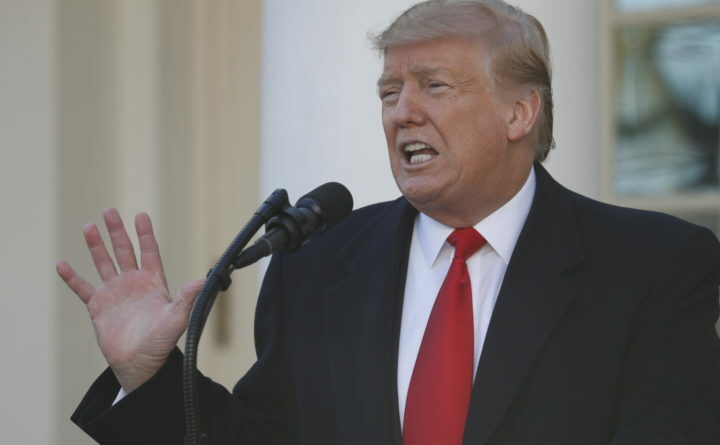 President Donald Trump offered a pessimistic assessment Thursday of congressional negotiations over border security funding and suggested he is ready to move forward with construction of his long-promised border wall without the consent of lawmakers. His tweets – which included a false assertion that large sections of the wall have already been built – came a day after Democrats unveiled a new border security plan that contains no new money for physical barriers along the U.S.-Mexico divide. The Democrats’ proposal was their opening bid in negotiations aimed at coming up with a deal to keep the government open when temporary funding runs out Feb. 15. Trump is insisting that funding for a wall or barrier be a significant part of the package crafted by negotiators. Trump has previously threatened that if Congress does not provide the $5.7 billion in funding he is seeking, he could declare a national emergency that would allow the military to construct a border wall without congressional consent. Such a move, which several leading Republicans have cautioned against, would almost certainly draw legal challenges. Earlier this month, Mexico’s Interior Ministry released figures showing investigators opened to 33,341 murder probes in 2018 compared with the previous year’s record of 25,036 in a country ravaged by drug cartels. “Lets just call them WALLS from now on and stop playing political games! A WALL is a WALL!” Trump said. Several White House aides have previously accused Democrats of being hung up on terminology. White House counselor Kellyanne Conway, for example, has said Democrats have sought to turn “wall” into a “four-letter word” in order to build opposition to Trump’s border-security plans. Although there has been some addition and replacement of fencing and other barriers since Trump took office, none of that is based on the prototypes that he commissioned to fulfill his marquee campaign promise. Writer Erica Werner contributed to this report.